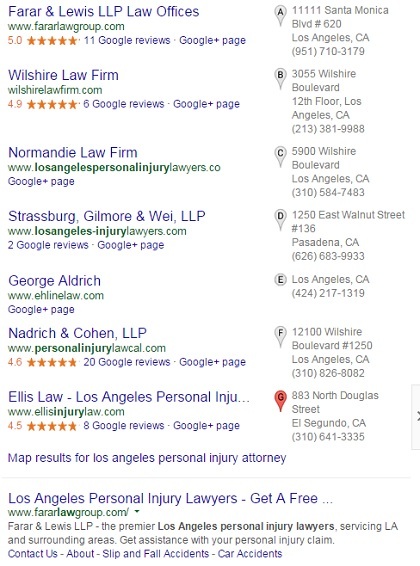 Today we’re going to take a look at the SEO status for Personal Injury attorneys in Los Angeles, California (January 2015 edition). This is part of an ongoing blog series: Local SEO Case Studies. If you follow this blog you know by now that I do SEO for personal injury firms around the United States. Some of my clients have been practicing over 30 years and are extremely successful and have been on TV, radio, authored books, and much more. Others are more new to the scene. I have studied every city in the US when it comes to personal injury. Some niches are tough and others are tougher. Sacramento CA, Dallas TX, Miami FL- those cities are pretty tough to tap in to. Los Angeles is hands down the toughest to rank in. There is constant spam, black hat tactics, genius white hat moves, and more taking place there. However, for those with the desire to rank and have the budget to do it is of course possible. After all, someone has to be on the front page, right? Most personal injury attorneys fight tooth and nail over legal terms that the general public simply doesn’t understand. This can be used to the advantage of any personal injury lawyer or firm that is willing to accept this. I have plenty of data here to back it up from people who DO rank on the front page. I can’t share it with you however ask any PI how much traffic they get each week for a particular legal term and it is going to be around 5 hits. The real traffic comes from long tail search which is accomplished by strategic and unique content. There are, however, a couple of terms that are gold: personal injury attorney and car accident attorney. Also, ranking for “money keywords” isn’t a bad thing by any means; it should always be a goal, and when a website has the authority to rank for those terms it can rank for plenty of other things on the same topic. Authority: For LA personal injury attorneys to rank they need all 3 of these pillars. I have ranked sites with almost zero authority, but, it isn’t going to happen in the personal injury niche, let alone in Los Angeles. If you are attorney in this area and you refuse to believe this, well, good luck. There are 100 places you can get free links that you need to start with from the California State Bar (a .gov link) to FindLaw, HG & other citations. After that you will need to get creative, very creative, to get high quality, relevant links to your site. You may end up paying a good SEO person 10 – 15 hours of labor to get an amazing link, of course, if you have seen the price PI’s pay for PPC this is pocket change. In this particular niche, authority is huge and you simply can not rank without it. Anyone telling you otherwise is, simply put, wrong. Relevance: Of course the more unique content you have the better your chances are at people finding you organically. Large and unique areas of practice pages will rank all over page 1 for long tail search terms. These, however, must be well organized. If your content is just a big collage of stuff it is eventually going to lead to high bounce rates and poor meta descriptions will lead to low click through rates, potentially negatively affecting search positions. Technology: Anything goes here although most of the PIs who rank in LA have finally moved on to WordPress which is pretty difficult to screw up (although it is, often.) Of course, a responsive website and a fast website are pretty much mandatory at this point. Search term: Los Angeles Personal Injury Attorney. Even after the 2014 Pigeon update, as of January 2015 attorneys are still getting a 7 pack of results. I have seen this particular 7 pack manipulated often but as of right now it is fairly cleaned up, and most of the results make sense. Of course, reviews here are very important, and, as in many local results, the top site that ranks in search also ranks at the top of the local results. As of January 2015 I’m seeing Lawyers.com, AVVO & Yelp on the front page of many searches in many cities across the US. This basically leaves only 5 or 6 spaces available for PIs to get coveted front page results. Farar & Lewis LLP has maintained front page results in Los Angeles for quite some time now. Their content is unique but there is not necessarily a huge quantity of it. It is short, sweet, to the point and well written. Their website definitely has authority. It has inbound links coming from Forbes articles and many other authoritative sites. The Wilshire Law Firm is very much in the same boat as Farar & Lewis and is doing very well. Normandie recently rose to the front page with an exact match domain (EMD) of losangelespersonalinjurylawyers.co. It is surprising that none of these 3 firms have on-site blogs but it just goes to show that in this particular niche authority is just that important and backlink quality trumps all. Girardi Keese & Bisnar Chase have both achieved front page rankings and maintain a blog. Dig through the results on the first and second page and you start to really see webspam at work. I am not mentioning who or how but if you are an SEO you can easily see the tactics at hand. I’ll cover the first 5 results. #1. Kenmore Law Group. This EMD is www.losangelescaraccidentattorney.co. After the first 3 are the pack results. #4. Farar. There they are again. They really do show up well for all sorts of searches. If I were in this biz I’d love to have their web presence. They could easily dominate even more if they have more content on their powerful domain. If they are getting anything less than 6,000 hits a month they need more content. (I have absolutely no clue what kind of traffic they’re getting). #5. Bisnar Chase (www.bestattorney.com). This site is pretty neat- lots of descriptive content. What do all of these sites have in common? No blog! Recently missing from page 1 search results is the Ehline Law Firm. They were doing very good for quite a while. Their content is split up all over a variety of subdomains which are essentially treated like different websites. No more commentary on this firm, but, I will say I like them a lot for reasons beyond the scope of this article and can’t wait to see them back; I’m sure it is only a matter of time. With a few changes which I will not mention they could return very quickly. I expect they will figure this out and return or retain the services of someone like me and be right back onto page 1. Content is king, unless you are a Los Angeles personal injury attorney. 1. Good on site SEO as a prerequisite, especially a responsive site that loads fast. I’d use WordPress. 3. Third and most importantly, authority. Backlinks from all of the standard places personal injury attorneys get links, links from local businesses and experts, and finally, links from high authority sites. Don’t even think about blog spam and press releases- if this is all you’ve got in your arsenal, take a hike. 4. Time. Nothing here happens overnight and the results from high quality authoritative links may take months to realize. 5. Money. Unless you have a whole lot of time you’re going to have to hire a pro. This isn’t something you can do for a month or two and stop, either. I know CA PIs who spend $10k – $20k/mo on their Internet presence as a permanent, ongoing cost of doing business. While you do not have to spend that much to rank, if you think you can just dominate search in this niche with some backlinks or blog posts you are only kidding yourself. New PIs may want to buy leads somewhere until they can build their rep and bank account enough to start a campaign that matters, or, start a WordPress website and start blogging- that will be a great head start. Some attorneys may even want to consider multiple web properties. It is shocking that none of these sites have a very active blog. If I were them I would start accumulating content. For the people who already rank well for a few key phrases- they could rank well for thousands of key phrases! And the up and coming sites, well, it is probably only a matter of time before an algorithm change rewards the content. Content usually is king. This is quite possibly the “most fun” niche that I’ve observed. It is a serious biz with lots of money at stake. That said, I absolutely love competitive niches like this and wish all of these people the best. Full disclosure: I have been worked on and off with attorneys in LA, but they are not on this list. There has been no special treatment for anyone here- this is a genuine non-biased glance at the personal injury scene performed on January 26, 2015 and my thoughts on the SEO scene for this particular, fun to observe niche. I hope to cover everything from apple orchards to Zumba here on my ongoing blog series: Local SEO Case Studies. I’d love to elaborate more on these sites but I simply refuse to say anything overly positive or negative about anyone or any company in any niche. My point of this article is to simply shed light on the power of website authority or perhaps spark a new idea for people doing their own SEO or what to expect when hiring an SEO. Hi Winona, feel free to email me here.